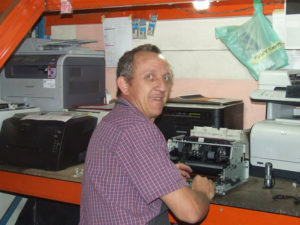 Our printer repair department is one of the best in Bloemfontein. Printer repair are done by our qualified technicians that are standing by on a daily basis to assist you with your needs. We have years of experience dealing with all types of printers. Our quality service and most of all our competitive prices is what sets as us apart from our opposition. There are often second hand and new printers that we sell. From time to time we have special deals on these printers. Please stay in touch to see if we are running specials on printers by visiting our blog or checking on our social media pages like facebook and twitter. CTEC believes in a service-centered approach so as to add value to our client’s needs. We believe that having the product only is not enough. Getting the cartridges there on time and offering our expert opinion accurately when needed is of utmost importance in order to build long-term relationships and to add value to our clients operations. We offer you our expertise and extensive knowledge as an added benefit and service on a continuous basis. We also offer our clients the convenience of an all-in-one printer maintenance solution through our service department. We service and repair printers and clients that buy their consumables from us, qualify for a FREE loan printer* while we’re repairing or servicing theirs. Quotations on printer repairs and services are also done FREE of charge. We believe through this approach, we give the client the advantage of a printer contract without the costs thereof – no hidden costs, small print contracts and expensive consumables! * Please note that we CANNOT guarantee to supply the client with exactly the same make and model of printer. Loan printers are subject to availability and will be FREE of charge for the duration of the repairs / service to the printer. We also CANNOT guarantee the compatibility of such loan printers on a network or other software. The normal cost of a printer service is currently very reasonable. We charge a fixed fee for a normal printer service. If any repairs need to be done you only pay for the parts. As mentioned earlier the quote is free of charge. At the date of the writing of this page, the cost for a service on a laser printer is only R290 + parts. The cost to service a ink printer is R190 + parts. These prices may change in the future, but we will keep you posted.